I wanted to try a simpler menu for She Who Must Be Obeyed’s birthday dinner, especially after I remembered all of the work that went into last year’s affair. Still, I knew our guests would be expecting something with a modernist twist, which led to my unearthing this recipe that I had filed away last year. I knew from prior testing that although the chemistry was straightforward, forming the spheres would try my patience. 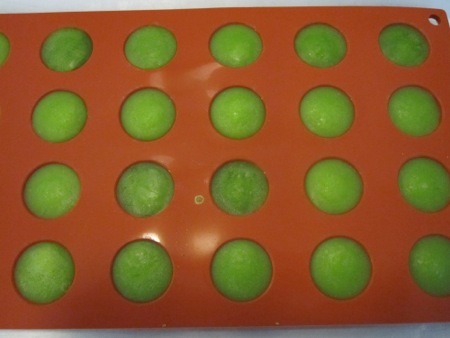 While shopping online for ingredients, I noticed a silicone mold designed to form perfect half-spheres that would be the perfect solution to my problem: How would I make the spheres a la minute without tearing my hair out? 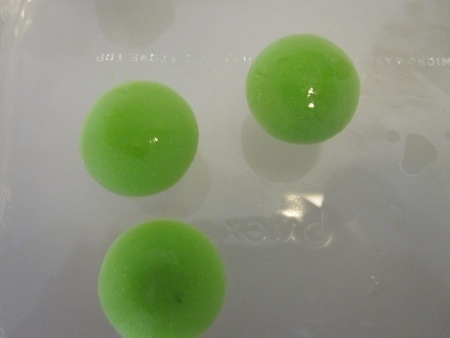 Not leaving anything to chance, I prepared a test batch of pea puree, added the sodium alginate, then filled the mold. Once they were frozen I prepared a calcium chloride solution and heated it to 110 °F, figuring it would take about five minutes for the spheres to thaw. Once the bath was ready, I dropped in a handful of the frozen half-spheres. As they warmed up, I flipped the spheres over every 30 seconds or so, which produced a more rounded shape. After five minutes I strained them out and rinsed them in a warm distilled water bath. About an hour before dinner I sliced brioche into small triangles, dipped them in egg/cream/maple syrup batter, then sautéed them until brown. While the toast cooked I caramelized shallots in sherry vinegar and brown sugar. 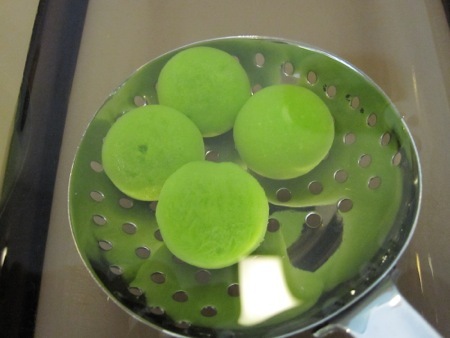 I prepared a new batch of spheres from fresh pea/mint puree I made earlier in the day, holding them in the warm water bath. To plate, I layered each toast triangle with a slice of prosciutto and some of the caramelized shallots, topped with a pea sphere. As you can see, forming the spheres by hand is not the way to go. Now that I’ve mastered the technique, I’ll be trying other flavors soon.